Have exchange rates affected Brazilian exports? Relative to most currencies, the U.S. dollar is especially strong right now. Some have suggested that the strong dollar is a root-cause of the depressed exports and prices for major crops. The idea is that a grain or soybean importer will buy from our competitors because, after taking into account exchange rates, the actual transaction price for U.S. soybeans may be considerably above the transaction price of our competitors. Accordingly, our competitors receive export bookings that would have gone to the U.S. under other exchange rate regimes, depressing U.S. export demand and prices. But is it that simple? The converse of this argument is that if exchange rates favor the U.S., our exports would receive a boost at the expense of our competitors, implying that a significant portion of their exportable surplus during that time would go unsold and accumulate as increased ending stocks. Yet, I find our competitors’ ending stock levels to be incredibly low and extremely stable across years compared to the U.S. In an earlier piece we saw that Argentina’s ending inventory of soybean complex products (soybeans, soybean meal and soybean oil) is nearly flat over time so that exports—not stocks—have buffered virtually all the variation in Argentina’s soybean yields and area harvested and domestic demands for soybean products. This swallowing-up of excess output by outbound ocean freighters has occurred in Argentina for decades despite enormous fluctuations in commodity prices and exchange rates during that time. The Argentines’ do not want to hold stocks so they do whatever it takes—read lowering prices as much as they need to—so that all excess output will be exported. This behavior characterized Argentina before and after 1992, the year Argentina tied its currency to the U.S. dollar. If all our competitors acted this way, they would ship sufficient exports so as to start each year with minimal stocks. The U.S. becomes the residual supplier, receiving whatever export orders our competitors could not fill. Thus, a favorable exchange rate could influence the speed at which competitors clear-out their exports but the volume exported would be the same irrespective of exchange rate considerations. So, what about our other major South American export competitor? Do Brazilian stock levels rise and fall abruptly over time or do stock levels remain small and relatively stable even during times when Brazil’s exchange rates are at a disadvantage to the U.S. or other export competitors? Figure 1 depicts Brazilian soybean complex data for three variables. The bars show surplus production defined as production (plus any imports) minus domestic demands for soybean complex products. The year-to-year variation in surplus production, or exportable surplus or exportable production if you prefer, is due to fluctuations in soybean yields, soybean area harvested and/or domestic demands. The top line graph shows exports and the lower line graph is ending stocks. Figure 1. Brazilian Soybean Complex surplus production, exports and ending stocks. The bars show surplus production, the top line is exports and the bottom line is ending stocks (thousand metric tons). Data source: USDA-PS&D. Clearly exports have absorbed more of the variation of surplus production than ending stock, especially from the late 1980s on. Since the late 1980s the exchange rates have gone from relatively strong to weak compared to the U.S. 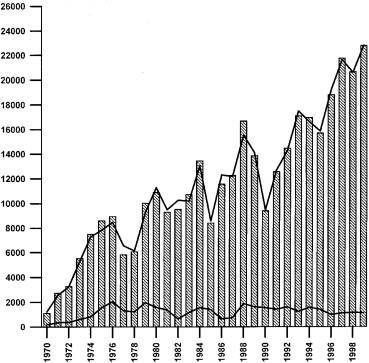 Yet, the export line graph traces the top of the surplus production bars particularly well since about 1989, suggesting that Brazil annually exported essentially all soybean complex products that were produced and not needed domestically irrespective of exchange rate levels. Graphs of soybean yields, area harvested and domestic demands (not presented here) show yield to be the major source of variation in “surplus production” and, hence, exports. Variation in area harvested contributed to export variation somewhat, especially prior to the 1990s. During the 1990s, soybean area has increased at a near constant annual rate, again, apparently affected little by exchange rate fluctuations. The data and observed behavior strongly suggest that Argentina and Brazil are committed to clearing out soybeans into the export market rather than storing them no matter whether soybean prices are relatively “high or low” or whether exchange rates favor them or not. What this seems to say is that our low-price policy has had little impact on our competitors’ export behavior and by extension our export volume. Crop export values (and farm receipts) sure take it in the neck, however.